"Knowledge makes wonders when it is effectively shared in social media". 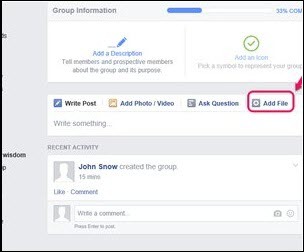 Imagine you have an interesting article or news that you wish to share on a Facebook group to your friends and colleagues. However it is in a PDF format and you do not know how to share PDF file on Facebook. If it is your present condition, then we have a solution to solve it in today's article. The solutions are really simple and we hope you will find it easier and useful. Take a look at this article and implement it as soon as possible and let your friends know what you have for them. 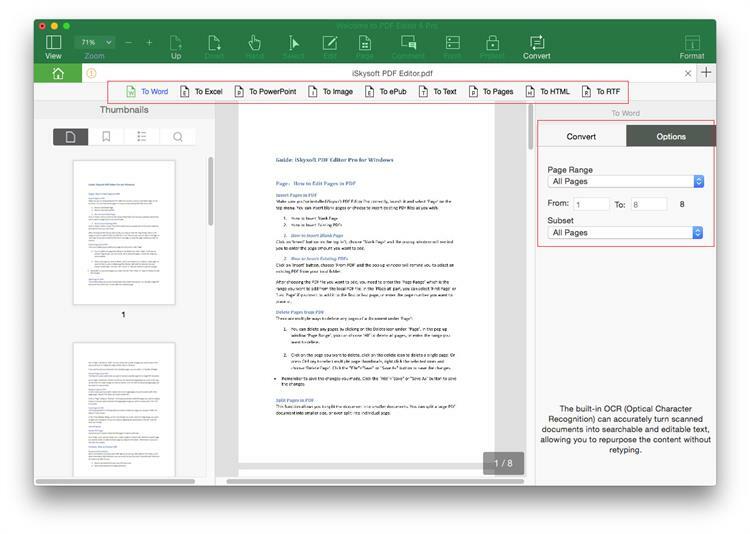 To share a PDF file in Facebook at ease, we are about to bring iSkysoft PDF Editor 6 Professional for Mac (or iSkysoft PDF Editor 6 Professional for Windows)to your notice. So, what can iSkysoft PDF Editor 6 Pro for Mac do to your PDF file? Can it only share PDF files on Facebook? No, absolutely not. iSkysoft PDF Editor 6 Pro for Mac is designed in such a way that it works well on both Mac and Windows platform. It is the best PDF editor up-to-date and with no doubt it proves it to all its valuable users. You can perform all operations including OCR, Annotation, Freehand drawing and adding stamps into a PDF file. Isn't it interesting? Well, you never need to be worried about the security of PDF files as you can redact PDF files permanently. Last but not least it is a versatile solution for your business. You can now share PDF on Facebook easily with the help of iSkysoft PDF Editor 6 Pro for Mac and to do so, simply follow the following steps. Install the iSkysoft PDF Editor 6 Pro for Mac application and launch it in your device. You will reach the welcome page where you can see various options like Edit, Combine and Convert. Click on "Open PDF" option and open the PDF file that is to be shared on Facebook. After you've imported a PDF to the program, you can click on the "Convert" button and choose the "To Image" from toolbar and start to convert PDF to image with ease. Once the conversion to an image is completed, save the file on your Desktop and click on "Save" option. Now, you can login into your Facebook account and share or post the PDF image to Facebook. 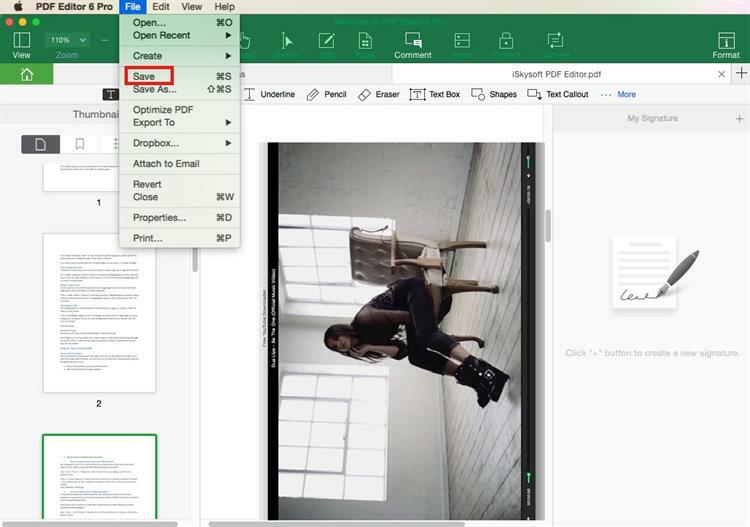 If you are looking out for a third-party software to perform varied operations on your PDF files, then iSkysoft PDF Editor 6 Professional for Mac (or iSkysoft PDF Editor 6 Professional for Windows) is the best and the most recommended application. It has the ability to take a control over your PDF files. 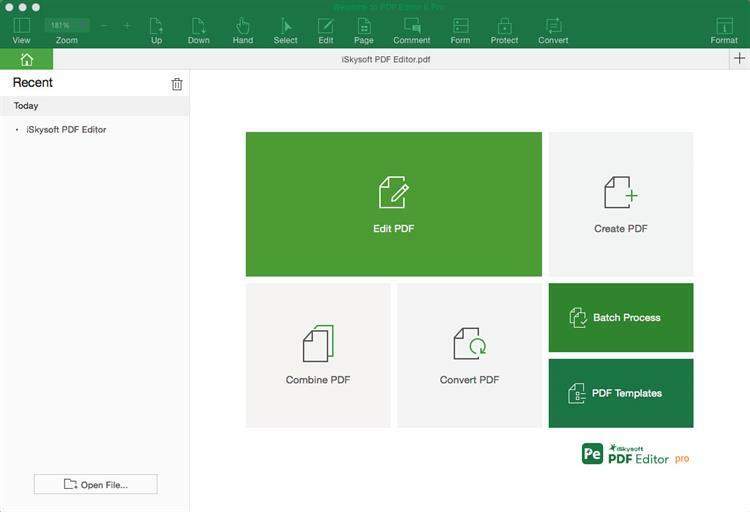 You can perform all top to bottom operations like splitting, editing your PDF contents and forms in minutes. This PDF editor is a professional solution to all your PDF editing's as it acts as an effective PDF editor. All documents and files are kept secured with the help of password protection. You can now easily share your files or PDF on various platforms like Facebook, Email, and DropBox too. To share an edited PDF file you can either highlight it or add watermarks to it. User-friendly interface for easy navigation. Capable of converting PDF files various formats including Word, Image, Excel, Pages, HTML, and EPUB. Allows you to perform OCR in converting, editing and extracting data in scanned PDF. Include links, texts, graphics and formatting in PDF files. Page descriptions and labeling can be done along with page numbers inclusion. You can Create PDF, format PDF, Watermark PDF, and Edit PDF, create and fill PDF forms too. Are you someone who does not want the help of third-party software to share your PDF files on Facebook? Well, the good news is that at present, sharing the PDF files to a Facebook page without software is also possible. So, read further and find out more about it. 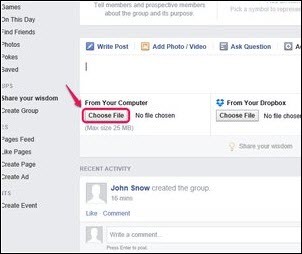 There are different ways to share or upload a PDF file to a Facebook group. You can upload it in the form of an image or you can also create a link for the PDF file and share it on your Facebook page. This process does not need an external software installation in your desktop and can be done easily in simple steps. Step 1. First of all, open the official Facebook website and login into your Facebook account with the credentials. As you can see on the left side, you will be able to see groups you are currently connected to. Choose any group from it. Step 2. 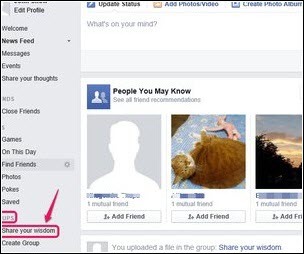 Select the group and now click on the "Add File" option that is available in the post editing section. Step 3. Hit the "Choose File" button and proceed further. Step 4. 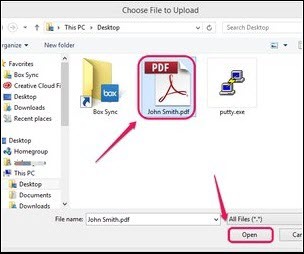 Open the corresponding PDF file that is to be shared and click on "Open" button. Step 5. Once the PDF file is loaded, hit the "Post" button. There you go! 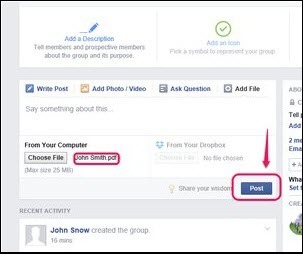 Your PDF file will now be shared in the Facebook group successfully.